With the change in seasons, your skin in turn needs to adjust to to the new environment and elements. 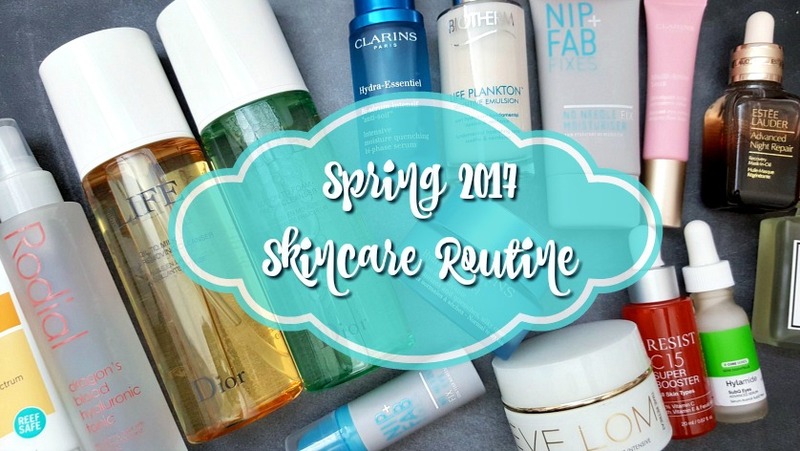 For example, in the winter the air is drier, there's less moisture in the air with the added cold temperatures means that the moisture will be sucked out of your face even faster - for me, in the winter time I tend to gravitate more towards cream and oil cleansers, or thicker night moisturizers. For those who know me, will know that I take skin-care quite seriously. Ever since I was young or even in my early teens, my mom and grandmother would tell me the importance of taking care of your skin. You only have one chance to treat it well - you can't turn back the hands of time, or wish for something else. You have to take care of what is given to you - it's hard to reverse the effects of damage once it comes. Anyways - while I do chalk a big portion of this to genetics, still it doesn't negate the fact that you need to take care of your skin. 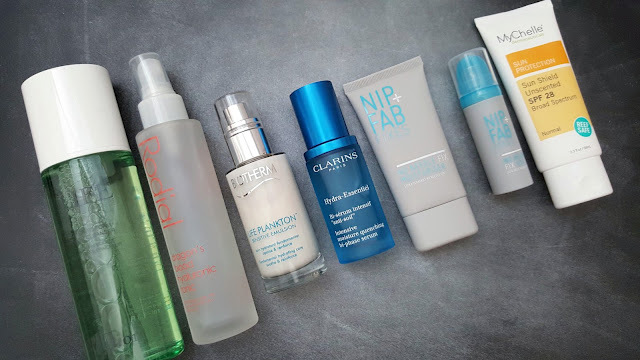 In the mornings, I prefer a lighter skincare regiment as I typically apply make-up afterwards I do not want to feel like there's a ton of product on my face. I prefer items that are fast absorbing and hydrating. The Dior Cleanser is light and refreshing, it keeps my skin hydrated and doesn't strip it. I spritz the Dragon's Blood Hyaluronic Tonic after drying my skin to instantly close the pores, add extra hydration and prep it for serum. The Clarins serum is a Bi-Phase one, it contains a light oil component to it that is VERY lightweight - it really moisturizes my skin and the oil instantly disappears into my skin. To add more moisture, I follow-up with a face cream. Which one I use is dependent on my skin that day - if after the serum and it is still feeling thirsty and like everything I had applied prior is gone, then I go for a thicker one like the Nip + Fab Needle Fix which smells of a light citrus scent to really wake you up. If after the serum and my skin is looking plump and well, then I just go for a light-weight one like the Biotherm Life Plankton. Simultaneously I apply the Nip + Fab Eye Cream so that it can plump up the under-eye and it prevents my concealer from settling in fine lines or creasing. If I don't put on eyecream, I find that the concealer really gets patchy and cakey and does not apply smoothly. On days that I just use a powder foundation or no foundation at all, I apply the MyChelle Sun Shield SPF 28. It absorbs quickly and dries down matte. It's really great. I typically uses a tinted moisturizer on most days that has a SPF of 50 so on those days I do not need to use the sunblock. Night Time is when I really pack on the moisture - everything I use is richer, more emollient and generally just richer in texture and consistency. The reason for this is because at night I am literally doing nothing but resting with no make-up on, so I can just let all the precious skincare sink into my skin and work its magic. I typically take my make-up off with a make-up remover or micellar water, however the Dior Life Oil to Milk Makeup Remover takes off my entire day's make-up without having to go the extra step of the micellar water. The oil really breaks down the eyeliner and make-up and also it does not feel greasy afterwards. I am a huge fan of the Nip + Fab Bee Sting Fix Toning Pads - the pads are textured and work as a liquid exfoliator to even out my skintone, help with uneven texture and to brighten the skin. Next is an oil - at night I go with oils vs. serums - The Estee Lauder Advanced Night Repair is light and adds a radiance to the skin - it is luxurious and makes you feel like it when you're applying it. The texture is like water! As a cheaper alternative, as the Estee is $100 approx, there is the Poetic Blend - Hero Oil. I discovered this brand at the One of a Kind Show and is a Canadian business - the scent of this oil is very relaxing, very therapeutic and helps you when you're trying to fall asleep. The oil is alot thicker in viscosity compared to the Estee one so if you do not like the feeling of any sort of weight on the face, I'd suggest the Estee. I mean the Poetic Blend doesn't feel that heavy, I personally don't mind it at all b/c I'm sleeping when this is on me. For the eyes, because I'm already using items that are richer, I use a lighter product on the eyes to prevent any melia from occuring - if I use anything too oily or rich under the eyes, like the Bobbi Brown eye cream, I get melia. Anyways, the Hylamide SubQ is watery and light weight and works to counter dark circles, wrinkles and de-puffs. This is the cheaper alternative to the Clarins Multi-Active Eye. This product has an applicator that has a metal tip that works to cool the eye on application of the product - just be mindful when you're capping the product as if you cap it on the wrong end, you may end up squirting more product into the lid. 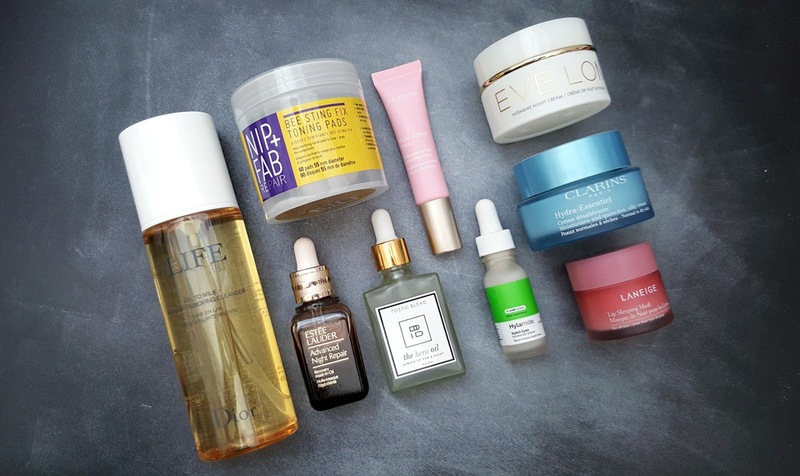 For the moisturizer, my favorite is the Eve Lom Moisture Mask - it smells glorious like a blend of essential oils and it's almost like applying soft butter to the face. It melts onto my skin and leaves behind a very light layer that works its magic through the night to repair and hydrate. I wake up with plump and revitalized skin that looks fresh. The more budget friendly alternative is the Clarins Hydra-Essentiel Silky Cream - equally hydrating, but absorbs alot faster than the Moisture Mask. This is a really good hydrating moisturizer and you wake up looking plump and refreshed - but if you like a thicker mask feel, then I would opt for the other. Lastly, if my lips are feeling quite dry, I like to apply a lip mask like the Laneige one that smells like a berry cocktail. It works overnight to soothe any cracks to the lips or roughness and gets rid of any peeling. I know that this seems like a very intense and long-winded regiment, but honestly it takes less than 5 minutes to apply everything. I often get compliments on my skin or that I don't look my age, and again while I do have to agree that most of it is genetics, it also is what you use to take care of your skin. Just because you are genetically predisposition-ed to have nice skin, doesn't mean that you can treat it like crap and expect it to work in your favor. Like everything in life, you need to spend time nurturing it. What are some of your favorite items to use in your daily skincare routine? Have you tried any of the products mentioned above out? Would love to hear your thoughts!